I've just spoken to Liz, from Mad Bush Farm blog, and obtained permission to mirror her post on Timespanner. The memory of Carbine, the famous racehorse who was bred at Sylvia Park and who died in England in 1914, will appropriately be kept green in Auckland by two interesting momentoes. Some time ago, Carbine's owner, the Duke of Portland,forwarded the skin as a gift to the Auckland Racing Club. The Committee of the club in view of the great interest attaching to Carbine and his great feats in the racing world, decided that such proportion of gift as was suitable for public exhibition should be presented to the Auckland Museum. The skin was to be found unsuitable for a full mounting in the ordinary manner, andit was decided to present the head and neck portion to the Museum. This has been successfully mounted by Mr Griffin, the taxidermist at the Museum. The interesting relic will be placed on a suitable shield, and will shortly be on exhibition in the Museum. An inscribed silver plate, containing a record of Carbine's Pedigree performances and total winnings, will be attached. The remainder of the skin will be converted by the club into a chair cover. Carbine's skeleton was presented by the Duke of Portland to the Melbourne Museum, where it has been set up. His name is to be found in the pedigrees of great thoroughbred racehorses. The mighty Nearco (Ity), Shergar (GB), and Sunline (NZ) are amongst the modern champions that have the name Carbine in their pedigree. 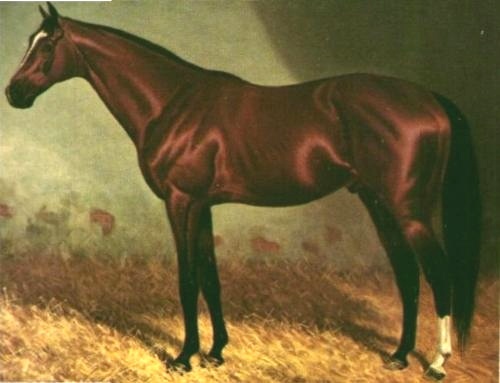 Carbine was foaled at Sylvia Park Stud in Auckland New Zealand on 18 September 1885. His sire the imported Musket (GB) (foaled 1867 Toxophilite -West Australian mare) was An Ascot Stakes winner and was already a successful sire. His dam Mersey (GB) was an imported mare who was also the dam of stakes winner Carnage (Foaled 1890 by Nordenfeldt (NZ) (VRC Victoria Derby, AJC Champagne Stakes). Mersey herself in her dam line traces back to the influential broodmare Eulogy (GB) whose name can be found in the pedigrees of many great sires and broodmares throughout modern times. Carbine has been well covered in history. His impressive race record consisted of total of 43 starts for 33 wins, six seconds and three thirds with total career earnings of ₤29,626. Major Stakes Wins included the 1890 VRC Mebourne Cup (Group 1) AJC Sydney Cup amongst others. As a sire Carbine proved to be outstanding. His sons included the Australian bred Wallace (Leading sire 1915/16 Season) 1906 Epsom Derby winner Spearmint and grandsire of Speamint's son Derby winner Spion Kop. Carbine was euthanised at the Duke of Portland's Welbeck Abbey Stud on June 10 1914. "Carbine the celebrated racehorse died at Welbeck. Carbine was out of work. He lived a life of laziness for four years, and was then destroyed. The Duke of Portland has offered his skeleton to the Melbourne Museum. " For years, the mounted head of Carbine resided in the Auckland War Memorial Museum keeping company with Rajah the Elephant. His impressive extended pedigree hung on the wall along side, with his tail mounted with silver beside the head. Sometime in the 1990's, the Auckland Museum loaned Carbine to the National Racing Museum, then based at Ellerslie Racecourse, as part of the collection of New Zealand's racing heritage. In 2003 the building in which the collection was housed was demolished, and the museum was left with no home. In 2006 the NZ Herald reported that a new $5 million museum to house the collection was to be established. It has taken 166 years to honour the thoroughbred in New Zealand, but we are almost there. Wendy Pye, chairman of the New Zealand Champions Racing Museum Charitable Trust, this week unveiled the design of the proposed museum, to be built at Ellerslie. The first thoroughbred landed in New Zealand in 1840 and the history of the industry that now adds about $1 billion to the gross national product each year will be highlighted in the museum, which is due to open in 2008. Funding of about $400,000 has already been received. Another $4 million is being sought to complete the project. Construction is expected to start Project support has been provided by New Zealand Thoroughbred Racing and the New Zealand Thoroughbred Breeders Association. A detailed model places the building within its setting, to the right of the main racecourse entrance, overlooking the Lawn Gardens and facing the Ellerslie Convention Centre. "The trust's vision for the museum is about celebrating the extraordinary history of thoroughbred racing in New Zealand," Mrs Pye said. "A national racing museum will allow us to share treasures and stories that will otherwise be lost or forgotten. "We also aim to use that rich heritage to create a world-class interactive experience for local and international visitors, a centre for equine research and education, and a welcoming gateway for participation in every part of the thoroughbred industry." Mrs Pye said the design of the museum exterior included elements of traditional stables but the interior would be that of a modern, interactive museum. The main exhibition area on the ground floor would include many elements of the racecourse experience. First floor displays would include a virtual race ride on an electronic horse, an equine science display, racing colours design and a permanent home for the recently established New Zealand Racing Hall of Fame. Also included in the complex would be a cafe, research area and a movie and lecture theatre. New Zealand's climate and environment proved to be perfect for breeding horses, with studs such as Trelawney and Cambridge adding to a national roll of honour that includes 41 Melbourne Cups. Kiwi-bred champions Carbine and Phar Lap established a tradition of international excellence maintained into the modern era by the likes of Bonecrusher, Horlicks, Octagonal, Might And Power, Sunline and Starcraft. Harness racing in New Zealand has a world class museum at Auckland's Alexandra Park. In November 2010 the following blog post appeared on Genealogy New Zealand. Lyn, who is the author, had noted that the entire collection of the National Racing Museum was in storage. Being such a big part of life in New Zealand you might think that the racing industry would have its own museum. It did have one at the Ellerslie Race Course up until 2003. It was run by enthusiastic volunteers with no real training and it became a central repository for regalia and records. But sadly, the building it occupied was condemned and the contents were stored in a very bad manner. This was soon rectified by a well-known business woman who moved the contents into a warehouse and a container. To cut a long story short; the NZ Thoroughbred Racing Board of whom Simon Cooper is currently head of, has the ownership of the treasure but doesn't seem to be doing anything with it. The Auckland Racing Club it still looking after part of the contents but again, doesn't seem very enthusiastic about it. Lyn went on to say she had contacted Te Papa and other business people concerning the collection. This in turn raised my concerns about the head of Carbine not being back in the possession of the Auckland War Memorial Museum. I contacted Auckland War Memorial Museum expressing my own concerns about the whereabouts of this important icon of the our national racing heritage and of Auckland itself. Finally I had a response from the museum who were not aware of the situation. They have now contacted Simon Cooper Head of NZ Racing to ask for the return of this champion, so he can be restored back to his rightful place, in the collection of the Auckland War Memorial Museum. The very thought that Carbine, long dead as he is - may be sitting deteriorating in a container somewhere in Auckland, is concerning to say the least. The museum are now going through archives to verify the loan of the mounted head to the former National Racing Museum. While Carbine, as a racehorse and influential sire, has received accolades in history and his other parts are on display in Melbourne, including his skeleton, and an inkwell made from one of his hooves. We have a situation, where the other remains are lost out of sight out of mind. No way to treat a champion of the former glorious racing past. Last year, it was announced the National Racing Museum project would not be going ahead. Meantime, we also have a very important collection rotting in storage somewhere in Auckland. The racing industry need to reconsider their lack of interest and do something about it. Carbine though should remain in Auckland back at the museum where he was originally displayed for many decades. I'll keep you posted on developments in the search for our iconic Carbine. I thought Carbine was an Australian horse. We do like to claim successful Kiwis as our own. Cool, go for your life, Sandy. I'll let Liz know. Thanks Sandy. We need this boy found and put back where he should be. At the Auckland War Memorial Museum not somewhere else. Last week i printed out and passed on this post to the powers that be... we'll see where it goes from here :-) .. I don't know if anything will eventuate but i hope so...it would be nice. I'm way behind in my Timespanner reading but want to wish every success with this Carbine project. Like Andrew, I'm Australian but with a Kiwi father who never let my brother and I forget that Carbine and Phar Lap were both NZ bred horses! Interestingly, the Blue Mountains Historical Society (of which I am a member) has premises that were a bequest from the McLaughlin family whose 19th C. patriarch John McLaughlin was a great racing man. His horse Correze finished third to Carbine in the 1890 Melbourne Cup. @John thanks for that I hope so too. Correze sounds interesting too I'll have to look up the pedigree and race record. You never know there might be a post about it sometime.